We still have the fresh, natural,whole wheat breads you’ve grown to love! 9 Grain, Cinnamon Raisin, English Muffin, Honey Whole Wheat, Sunflower Wheat, Old Fashion White, Sourdough, Cranberry Orange, Jalapeno Cheddar, French, Garlic Cheddar, Spelt, Challah. 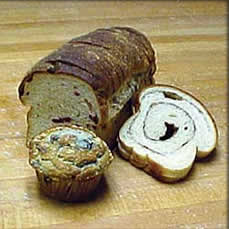 Light, German Dark, Marble, Pumpernickel, and other specialties when available.